Badge No. 219’, seated in one of the last rows, is nervous. It will soon be his turn to go up on stage, where he will have to introduce himself to 30 prospective brides and their families. As other candidates get called, the tension mounts. He is one of 225 Patidar bachelors between the ages of 23 and 43, from businessmen to employees, who are here to find a match for themselves. Some years ago, after much deliberation, community leaders decided that Patidar men could marry Kurmis, a peasant caste in north and western India, whom they consider their “equivalent”. 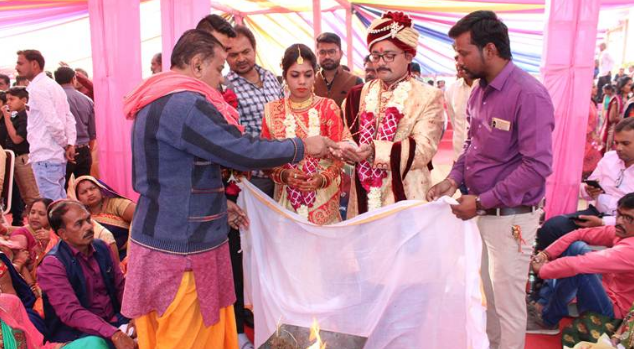 This year, for the second time, the organisers — the Hardasbapu Patel Samaj Kalyan and Kelavani Trust, a Patidar organisation, and the Bhopal-headquartered Akhil Bhartiya Kurmi Kshatriya Mahasabha — decided to look beyond Gujarat for Kurmi brides. While most of the girls last time were from Odisha, this year the 30 have also come from Rajasthan, Madhya Pradesh, Bihar, Chhattisgarh, Maharashtra and Delhi. “Also, this year, there has been an attempt to bring in more educated and qualified girls,” says L P Patel, president of the Kurmi Mahasabha. While educational qualification was not a criterion for Patidar men, they needed to own a house, be resident of Ahmedabad, earn more than `20,000 a month and not demand dowry from the bride. Most of the prospective grooms this year are from Nikol, a Patidar locality in Ahmedabad. In 2015, Nikol had witnessed massive protests during the Patidar Anamat Andolan Samiti stir for OBC status. On the outskirts of Ahmedabad are three giant tents, the venue for the mass wedding, with temporary accommodation for the girls and their families. Much of the action takes place in the main tent, which has a small elevated platform. It’s on this platform that the Patidar men make their introductions into the solitary microphone — as other prospective grooms line up behind — facing the Kurmi girls. The candidates, both men and women, wear blue badges, with their numbers in bold white. “Number 219,” calls out the organiser. The man walks to the platform. “My name is Bhavesh Savaliya, I am 26 and I am a Class 10 pass. I have an embroidery business and earn `25,000. I own a house,” he says. Younger brother Brijesh, sitting in the gathering, leans in his chair to take a closer look at the girls on an LED screen. “There is no dress code, but I think we will now insist the boys are at least presentable. Look at that boy… he is in torn clothes,” says Maganbhai Ramani, one of the organisers, pointing to a candidate in ripped jeans. A little after 2 pm, as the candidates reassemble, Kanubhai Bidiwala, the announcer, names the 10 men who have got the highest nominations. He calls each of them, in descending order of nominations received, and the girls who have chosen them, on stage. Bhavesh looks crestfallen. He isn’t picked. Each of the Patidar candidates gets to ‘select’ one of the girls and meet her in one of the 10 cabins that’s cramped with relatives. Just then, one of the organisers rushes to Kanubhai: “Dikri number 13 ane dikro number 43, nakki thayi gayo (Girl No. 13 and Boy No. 43 have agreed).” A cheer breaks out. Around 8 pm, the organisers decide to call it a day. It has been disappointing so far — only seven confirmed matches. But for Bhavesh, there is a glimmer of hope — Anjali Patel from Jabalpur, Badge No. 7, has chosen him. Anjali has other men on her list though and she is meeting them as well. “I have no option but to wait,” says Bhavesh. Disappointed with the progress on Day 1, the organisers dig into their database of 300 registrations and call up all those who did not turn up on the first day. “Since most of the girls have higher qualifications than the men, we have decided to look for boys with better qualifications,” says Babubhai Vora, president of the Kelavani Trust. Bhavesh’s hopes narrow further. Anjali, 26, is a post-graduate in science, little chance she would choose a Class 10 pass. At the end of Day 2, the match count doesn’t move beyond seven, so the organisers decide to continue the search on Day 3, the ‘engagement day’. Around 11 am, as a priest gets the seven couples engaged, in the cabins in the background are fresh rounds of meetings. The organisers make sure that the bride and her family have visited the groom’s house to verify his claims. The announcer also asks couples to get their blood samples tested. “We get couples tested for HIV virus, thalassemia and sickle cell anemia,” says Kanubhai. This year, the organisers sent out special invitations to couples who got married in earlier editions of the Patidar-Kurmi mass wedding. Among them is Ketan Patel, who married Rani from Bhopal three years ago. “These girls from outside are better than Patel women,” Ketan says. “If Patel women don’t get what they want, they will keep us hungry. Yeh adjust kar leti hain (These women adjust).” The room is filled with laughter. The organisers are, however, sceptical and ask the enquiry committee to verify. “She is an MSc and is teaching. Please ask her why she selected a boy who is only Class 10. She has seen two boys, visited their homes, but turned them down,” says Kanubhai. Anjali is accompanied by 28 people from her family. “My father runs a tea stall at the local station and my mother does sewing work. I teach in a private school and also at a coaching centre,” says Anjali. It’s now 4 pm and there is no time for an engagement — plus there is shopping to be done for the big day, January 8. The families and the organisers decide the couple can exchange rings on the wedding day. At the end of Day 3, the final couple count is a poor 11 — in 2017, all the 24 Kurmi girls who applied had got married. There are four more stops — for jewellery, saris, cosmetics and shoes. With language often coming in their way, there is little conversation between the two families. Among Anjali’s relatives, there is high concern about the other side’s food habits. “Arrey, yeh log har cheez mein meetha dalte hain (Their food is all sweet),” Anjali’s aunt complains on way back to the venue. “We do seven rounds around the ritual fire; they only did four. We got the panditji to do three more,” says Anjali’s aunt. “They do not know our rituals,” says an old woman on the groom’s side. As the rituals wind up, Anjali’s mother goes up to Bhavesh’s mother and asks her to take care of her daughter. As Bhavesh’s mother looks baffled, his brother intervenes and tells her not to worry. Previous post: OPINION POLL VICTORY WAS TRIUMPH OF SECULARISM!